How to prevent tooth decay using nature's table sugar substitute. A) Chewing stimulates the flow of saliva. When you consume a sugary meal, some of that sugar will become food for the cariogenic (decay-causing) bacteria that live in your mouth. As they digest it, they'll create the acidic waste products that are responsible for causing decay. It's a well-documented fact that, from the time food is consumed and then over the next twenty minutes or so, the acidity of a person's dental plaque rises significantly. This time period provides a window of opportunity during which tooth demineralization (decay formation) can occur. Our page How cavities form may help you understand this page better. Getting your xylitol exposure via chewing gum makes an especially good choice. The act of chewing gum (anything really) causes your body to produce more saliva. This is important in regard to cavity prevention because saliva has a buffering, neutralizing and diluting effect on the acids that cause cavities. That means an increase in salivary flow can help to moderate the acidity of dental plaque, hopefully to the point where it is not concentrated enough to allow tooth demineralization to occur. In the case where you can't clean your teeth immediately after eating or drinking sugary foods, going ahead and chewing a piece of xylitol-sweetened gum makes a great idea. You'll increase your flow of saliva at exactly that point when bacterial acid production is at its highest (the twenty minutes right after a snack or meal). You'll get a part of the total xylitol dosing that you need for that day. Other things that increase salivary flow. That means xylitol mints, candies and the like could be used in similar fashion as gum. Gum's advantage lies in the fact that it stays in your mouth, and you continue to chew, for such an extended period of time. Even chewing regular sugarless-gum can provide the same benefit as described on this page, with the exception that it obviously won't deliver a dosing of xylitol. B) Gum chewing can help to clean teeth. The act of chewing a piece of gum may help to dislodge dental plaque from a person's teeth. By no means can this type of mechanical cleansing be considered to be as effective as tooth brushing. But this action may play a small role in helping to prevent cavities. The gum should be a sugarless type. Xylitol gum would make an excellent choice. 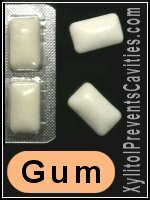 Can swishing and "chewing" xylitol crystals in my mouth several time a day help prevent cavities from forming in muy mouth. Will this take the place of using fluoride rinse? Right. That seems a good plan. All you need to do is create a xylitol exposure in your mouth (so the bacteria there get a chance to feed on it). So just using xylitol crystals is fine. Having said that, the advantage of chewing gum is that the xylitol exposure takes place over an extended period of time (while you chew the gum). So, if using granules, make sure you don't rinse or drink immediately afterward. Let the xylitol linger in your mouth for as long as possible. And yes, breaking your dosing up into many exposures a day helps to increase the bacteria's exposure to the xylitol too. In regard to fluoride. Xylitol and fluoride work by different methods and can be used in conjunction with each other. So, if you want maximum protection, use both. If for some reason you want to avoid fluoride use, xylitol helps to give you some level of protection in its absence. Or, if you already use fluoridated toothpaste and have fluoride in your drinking water, that might be enough exposure (ask your dentist for their opinion) and therefore substituting it with the xylitol approach might be a way of adding protection on a different front. Is there a xylitol gum that is most like regular old Winterfresh Gun...mint flavored and not a tough as Spry? We're sorry we don't have an answer for you. Possibly one of our website visitors does and could leave a comment. Ask a question. / Share what you know. Excessively long submissions may be edited for brevity and clarity. Comments that don't relate to the content of the page they are posted on especially well will be moved to a more appropriate one after a few days. Copyright © 2008 - 2019 WMDS, Inc. All rights reserved. When you use our affiliate links, your purchases help to support this website at no additional cost to you. If you do, thank you!